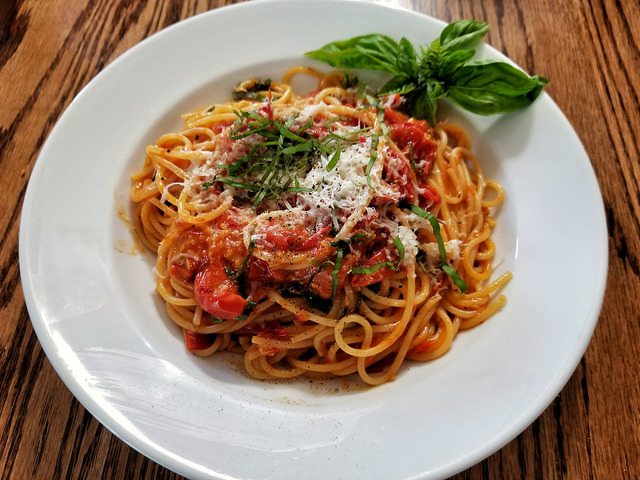 Part gourmet market, part restaurant, Sugo Cucina Italiana boasts a menu and a deli case packed with authentic Italian eats. While fresh mozzarella and burrata mingle with prosciutto di Parma and pancetta in the market, the kitchen team dishes out everything from parmesan-dusted lasagna to fresh cannolis in the dining room. So whether you want to build your own meal at home or leave it up to the professionals, Sugo Cucina Italiana can oblige. For those who opt to sit down, start with an order of the garlic knots or Gina's meatballs, which come embellished with marinara sauce and romano cheese. Then, dig into a plate of fresh pasta like Rudy's fettucine tossed with shrimp, tomato, spinach, and a creamy parmesan sauce. You can also opt for a classic entree—think chicken marsala and eggplant parm—or a panini.